We have just reached a huge milestone – 4 million classifications! What does that mean? To make a HiRISE image manageable, the Zooniverse team cut the images up into sub-images, called cutouts. Fans and blotches are identified in each cutout, and when a cutout has been viewed 100 times it is retired. Four million… I am still amazed at the investment of your time that this represents. I am humbled that you all have invested your free time in this project, a bit of Mars science that delights and fascinates us by its alien nature. I hope that you have enjoyed doing this, enjoyed the pleasure of looking at this unearthly terrain. On Mars today it is autumn in the southern hemisphere. The CO2 (carbon dioxide) is freezing and/or snowing onto the surface. Over the winter it will anneal into a sheet of translucent slab ice. In a little less than one earth year it will be spring in the southern hemisphere of Mars and we will start our 5th year of observations. Fans will pop out from under the ice like Martian crocuses. Will they be in the same place? Will the winds be stronger or weaker? Will we see any permanent changes in the surface or just the ephemeral seasonal activity? With your continued efforts we’ll be able to detect long-term trends. As soon as our current collection of cutouts has been analyzed we will add the images from our 4th year of observations. Then we’ll add the 5th year. 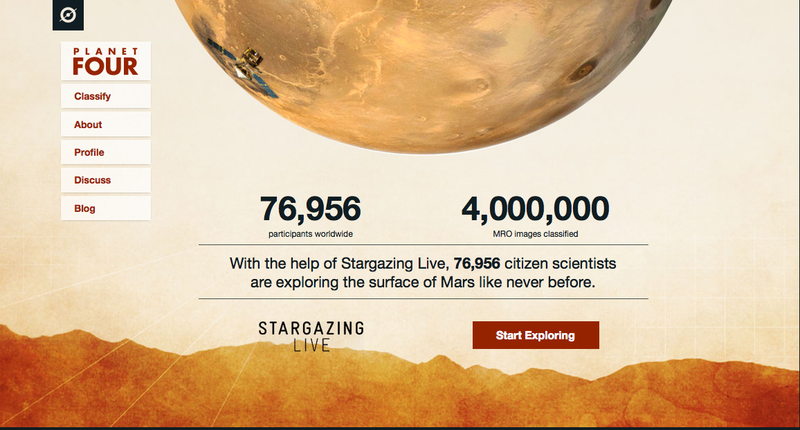 Four million… You are awesome!